I know it must seem silly to post a picture of a Google Chrome ad on a blog, but I find it really funny and interesting. Are there any Google Chrome ads in the US? I feel like Google is such a vital part of every American’s life that the moment the company comes up with anything new, everyone and their mother knows about it without any advertisements. I’m of the opinion that Google doesn’t need to advertise in the US. Although Google is also a major part in every German’s life (well, every German who uses the internet. 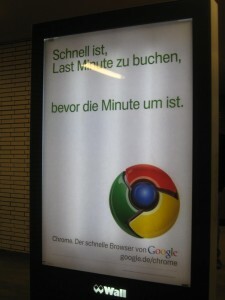 They even have a verb, googeln, which means to google something), I was surprised to see so many Google Chrome advertisements on the U-bahn platforms and at bus stops. The teachers had wanted to take me out for the longest time (since October!) but due to schedule differences, people getting sick and breaks happening, we finally managed to schedule a dinner date for last Friday night. Only B couldn’t come, which was a disappointment for all but I’ll have to ask B to have a beer with me sometime soon because hanging out with the other teachers was so much fun!!! We went to an Italian restaurant on Savignyplatz (in a posher area than where I live, but let’s be honest, any area could be posher than mine) and the teachers paid for everything: an appetizer, main course and lots of wine. We decided to head to a nearby bar and J and A bought all of us two rounds of drinks. I was the only one with beer, A and J had cocktails (they were also puzzled as to why I didn’t really drink cocktails often) and U had wine. They reassured me that the students loved working with me and that there were no exceptions: all the students loved me. This is truly hard for me to believe because I’ve never worked with kids before, outside of my one private student whom I tutored last year in German (she was a high school student). I didn’t want to talk too much during our get-together because 1) my German suffered because I’ve been speaking almost non-stop English with my siblings, 2) I love listening to German if the speakers have really nice voices, which all the teachers do and 3) their conversations were so engaging. I absolutely loved hearing about the differences between East and West Germany. Fun fact: Savignyplatz was a really renowned hang-out place for West German students when the wall was still up, and J and U used to frequent Savignyplatz when they were students. A is from East Germany and related some of her stories to us. The three most surprising things for me were: getting to know these extraordinary people as my fellow colleagues, being treated as such anddddd we ended our night at 11:40 PM. Wow! This is based mostly on my parents, but I’ve never really known anyone married to have a fun night out with one’s colleagues on a Friday night without giving a second thought to the other person. Most of my friends’ parents and my own usually do things together, and never stay out quite late with their colleagues. I mean, yes, there are poker nights and whatnot, but I find that many Americans (again, based on my own experiences and my friends’ parents) usually invite their significant others when it’s work-related. Or maybe…Americans just don’t really get to know their colleagues on such a personal level after marriage is involved? 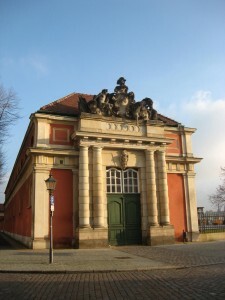 This entry was posted in Jill Nguyen '10, Fulbright to Germany and tagged Colleagues, Google. Bookmark the permalink.